Survation’s most recent poll on behalf of the Mail on Sunday asked a range of questions about Cameron’s efforts to block the appointment of Jean-Claude Juncker to President of the European Commission, in addition to voting intention for the next General Election and a possible referendum on Britain’s membership of the EU. The key findings are summarised below, and the full tables can be found here. 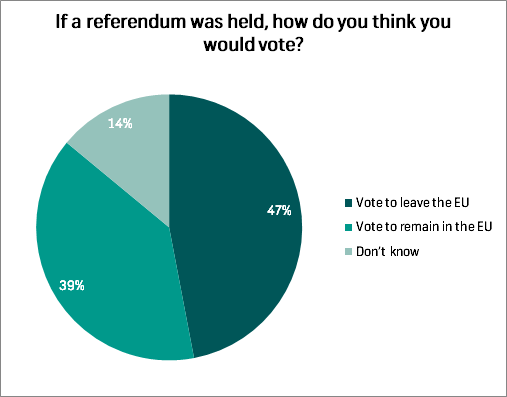 Excluding those saying ‘don’t know’, 54% would vote to leave the EU, and 46% to stay. Attitudes to continued EU membership are clearly contingent on how the UK’s relationship with the rest of Europe may change over the next few years. 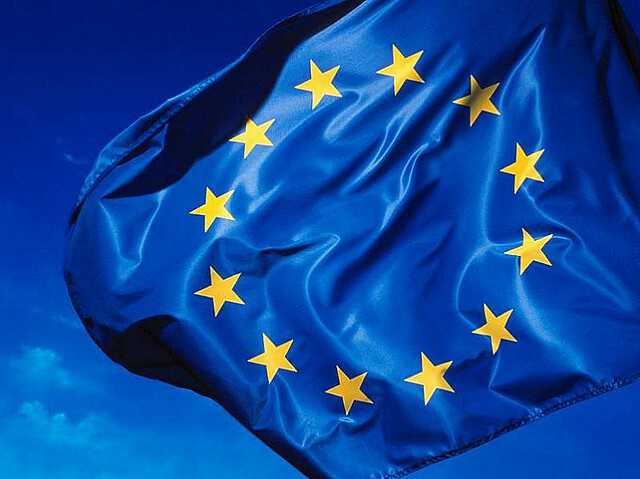 41% say they would vote to remain in the EU if the UK were able to “secure some concessions from other European leaders” in a renegotiation of the UK’s membership of the EU, with 37% saying they would vote to leave. 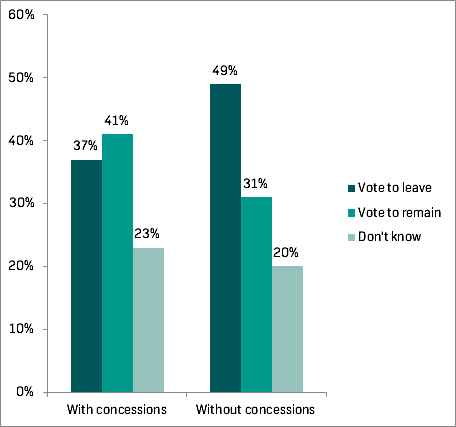 By contrast, if no concessions are secured, 49% say they would vote to leave, and 31% would vote to stay. However, Juncker’s appointment as President of the Commission does not seem to be a key consideration for a majority of the public: 61% said it does not affect how they are likely to vote in a future EU referendum, but 30% said it makes them more likely to vote to leave the EU. There are striking, if unsurprising, differences across party lines on the question of EU membership, as the chart below shows. 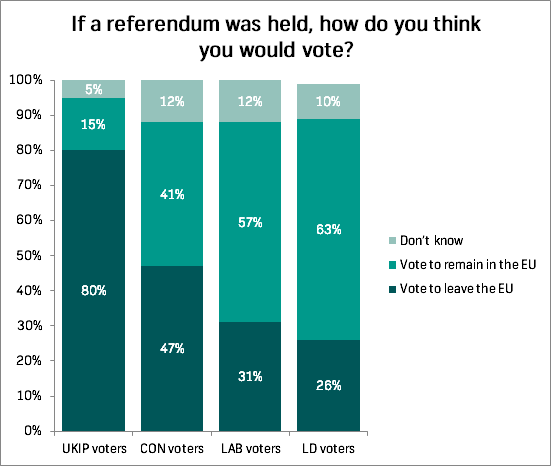 Breaking down the figures by voting intention for the next general election, a majority of Labour and Lib Dem supporters would vote to remain in the EU, with Conservative voters more evenly split with 47% wanting to leave and 41% wanting to stay. Comparing Cameron and Miliband, 36% think Cameron has the best policy on Europe compared to 23% who chose Miliband. 42% thought that Cameron would be able to secure the best deal for Britain in EU negotiations, with 24% opting for Miliband. Survation polled 1,000 adult residents of Great Britain via online panel on 27th June 2014.